Check out how we design your rooms. 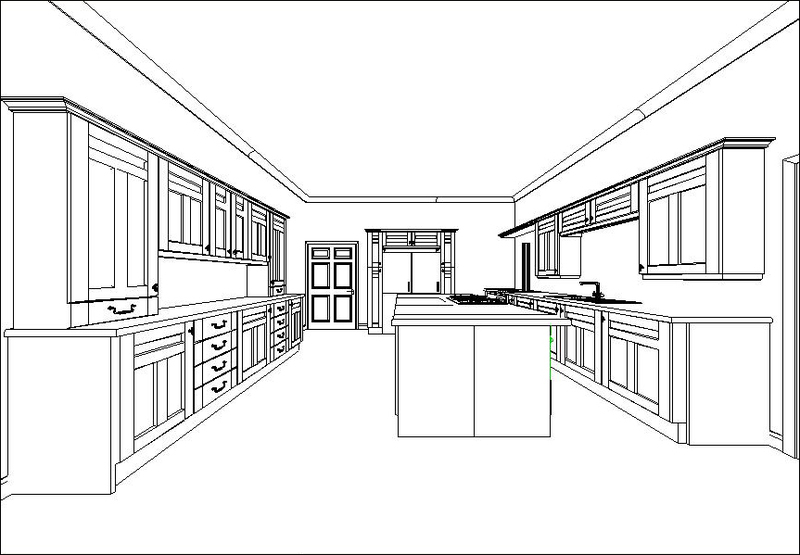 Below is a Plan, a 3D Line Drawing and a 3D Visual Image of one of our Kitchen Design. To enlarge please click on an image. 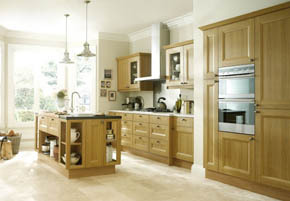 Re-Style offer a complementary design service, producing a design scheme and estimate to match with your requirements. At Re-style we strive to ensure no detail is overlooked when turning your design into reality. 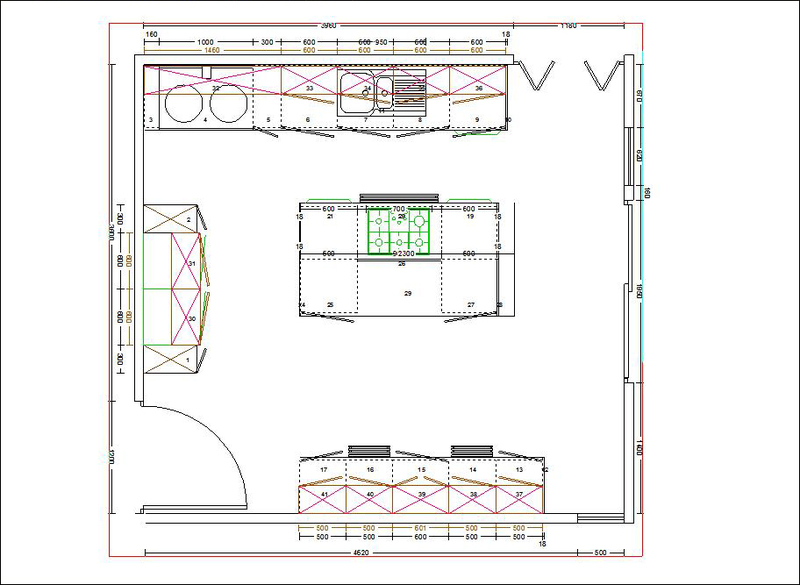 We use traditional hand drawn plans and perspectives, along with software to create 3d images to help you visualise your project in full. 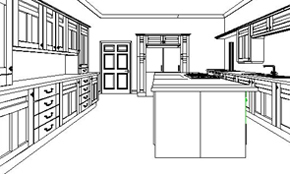 We can assist with project management, using trades people who we have used numerous times, whose skills and attention to detail give each project that finishing touch. We will work alongside your preferred trades people to achieve the same results. We are one of the most cost effective companies in the UK. Re-style does not have a showroom facility, the facilities are expensive to set up and run. The cost inevitably met by the clients. Therefore we come to you. 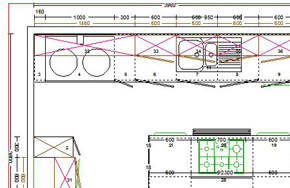 Your ideas, the imagination and skill of the designer are what fulfil your requirements. Re-style aim to design and assist you to ensure that your ideas and requirements are met to the highest standards. The first step is to discuss with you what you would like. We measure on site, or as we do for a lot of architects, we work from plans with their clients, so that they have an opportunity to throw lots of ideas into their wish lists for the new build. There is no charge for the design service, and definitely no high pressure sales techniques. No matter what shape or size of area, we will find solutions and pleasing designs, and can usually work to a budget. We design using hand drawn and computer generated images, to give you a realistic idea of what your kitchen/bedroom can look like. We bring our door samples to you, so that you can see them where they are most needed, in your home. Quite often you will find that expensive showroom lighting alters the colours of the door facias. With the sample doors on site, you can see exactly how they will look. Once a contract is signed, we can commence with ordering. Our speed of service is second to none, in some cases we can have your kitchen delivered in less than two weeks. Fine bespoke work takes a little longer, but usually within 4 – 5 weeks. We do a supply only service, where the kitchen can be delivered direct to you. Re-style pride ourselves on our aftercare service. Our products all carry guarantees, some for as much as 25 years. Appliance products are subject to manufacturer warranties.